President Clinton was a major supporter of the Irish peace process. He took the strongest position on Irish issues ever taken by an American president. His Irish roots are from his mother, Virginia Cassidy Kelley, who was the granddaughter of emigrants from County Fermanagh. Clinton was named Irish American of the Year by Irish America magazine in 1996 and was inducted into the Irish America Hall of Fame in March 2011. 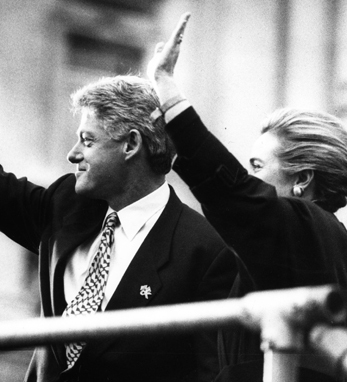 Bill Clinton’s first visit to Ireland in November 1995 was truly historic. Huge crowds turned out, and in Belfast an estimated 50,000 people from both sides of the sectarian divide saw him deliver a strong message for peace. It was the first time a US president had been to Northern Ireland. Clinton played a key role during the crucial lead up to the Good Friday Agreement – a pivotal moment that established the Northern Ireland Assembly. Senator George Mitchell, the man he personally appointed as his peace emissary, brought all of the parties together to sign the historic document on 10 April 1998. In good times and bad, Clinton has continued to persevere on Ireland, a fact that makes him hugely popular with Irish Americans. As the political parties feverishly worked to make a Northern Ireland government a reality, Clinton was always on hand to pick up the phone – or to remind party leaders what they stood to lose if an agreement was not reached.